'We Have To Negotiate In The End' With Syria's Assad, Kerry Says : The Two-Way The comments were made to CBS. The U.S. has previously said the Syrian leader "needs to go." But nearly four years into the Syrian civil war, there are few signs of that happening. Secretary of State John Kerry told CBS News the U.S. is pushing for Syrian President Bashar Assad to seriously discuss a transition strategy to quell the Arab country's four-year civil war. U.S. Secretary of State John Kerry says the U.S. and its allies will have to talk to Syrian President Bashar Assad to bring about a diplomatic solution to the Syrian civil war. 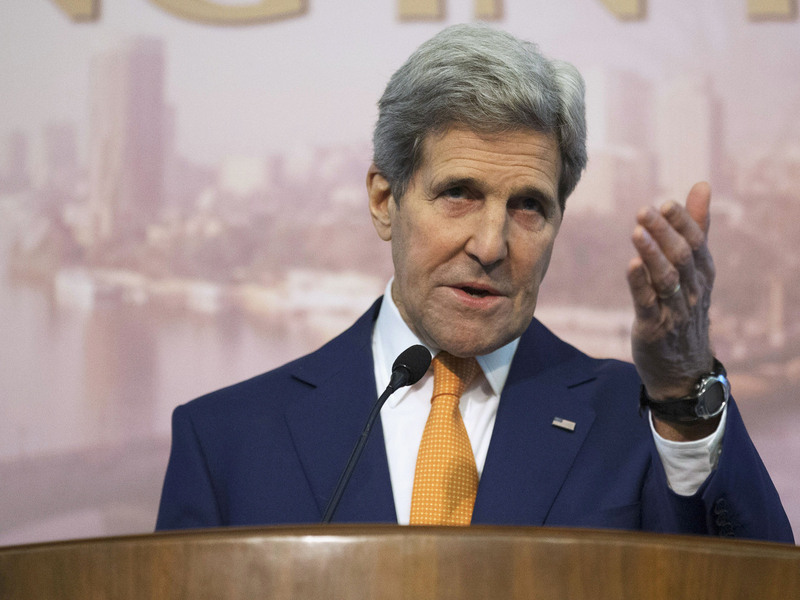 "We have to negotiate in the end," Kerry told CBS' Face the Nation. "And what we're pushing for is to get him to come and do that, and it may require that there be increased pressure on him of various kinds in order to do that. "We've made it very clear to people that we are looking at increased steps that can help bring about that pressure." The U.S. has previously maintained that Assad is "part of the problem and needs to go." But nearly four years after the Syrian civil war began, there are few signs of that happening. The fighting has claimed more than 220,000 lives, according to U.N. estimates, and created a massive refugee crisis. There are nearly 4 million Syrian refugees spread out across the region. The civil war pits Assad's forces against a coalition of opposition groups who range in affiliation from pro-Western to left wing and Islamist. The fighting has also bolstered the self-described Islamic State, which has captured large portions of territory across Syria and Iraq. Talks in Moscow in January brought together Assad's representatives and opposition figures, though the main pro-Western group did not attend. Kerry told CBS that the U.S. was "working very hard with other interested parties to see if we can reignite a diplomatic outcome. "Why? Because everybody agrees that there can be no military solution." He added: "We're going to have to make it clear to him that there is a determination by everybody to seek that political outcome and change his calculation about negotiating. That's underway right now." Kerry's remarks to CBS were made in Egypt before he traveled to Switzerland to resume talks with Iran on its nuclear program.